There are some fish as needy or picky as betta fish, but there is the misconception through the public that they’re easy going and low maintenance. Bettas are picky from the beginning, starting with their tank. While you might pick up a betta fish from your local pet store in a small plastic cup, that is no indication of what their home should be. Bettas are so popular because they are gorgeous, then we convinced ourselves that they were also low maintenance. Bettas are notorious for their aggression and commonly referred to as the Japanese fighting fish. They aren’t going to tolerate a tank mate. This aggression makes many aquarium enthusiasts and casual fish owners put them in small tanks. Because they aren’t housed in a tank with much other fish, their tank does need careful consideration. You don’t want a huge tank for just one fish, but you don’t want to enclose your betta in too small a space either. We’ve gone through and found the best betta fish tanks available! Hopefully one will be a great option for you and your colorful, fan-finned friend. Betta fish are depicted as a beautiful but common and uninteresting fish. This couldn’t be further from the truth. While it is easy to find a fish tank that works for reef or cold-water environments, all you’re doing here is trying to please one fish. Unfortunately, that makes this process more difficult. The preferences of your betta, combined with where you want the tank will build together and reveal the most valuable betta fish tank for you. That’s right, common and uninteresting are two words that just don’t describe bettas. They have personality and because they must be housed alone, you notice this person and their little quirks. Each Betta likes different things and interacts in different ways. You may have to run through a few trials before you find the tank that works best for your Betta. So, don’t be discouraged if your first attempt doesn’t win you their affection. If your Betta is exceptionally energetic, you’ll need a bit more space in their tank and probably could benefit from adding a few decorations. They may enjoy hiding and playing. However, if your Betta is exceptionally calm they’ll be very happy with a basic tank, no decorations and won’t need much space. But, take into consideration the necessities as well. Think first of their needs. A filter or aerator of some form, and enough space at least for them to be comfortable. Where will the tank sit? Do you mind electrical cords running into and away from the tank? How big of a tank is reasonable for you? Do you prefer the lights in multiple colors or is plain white fine? These questions will help you identify which the best betta tank for you and your betta is! Your answers to these questions can help you rule out potential tanks, and ultimately decide on the best. We’ve done the research and dug through everything we could find. From the best brands to the unknown up-and-comers in the aquarium world, these are the top 5 betta fish tanks available now. This tank is only 2 gallons big, but it packs a major punch. It comes with all the bells and whistles you could imagine including a UV sterilizer. 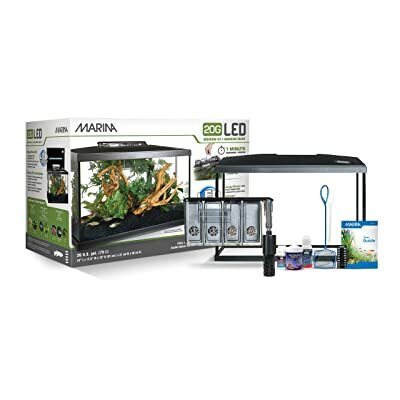 It’s a complete starter aquarium kit with an aquaponics filter, decorations, sand substrate, glass cover, a mountain stone for decoration and a wireless remote for the LED system. Basil seeds are also included if you want to plant them in the tank. You can also use green onion bulbs to help the ecosystem thrive. Do be sure to let it have some natural sunlight if you plant anything in it. If you purchase this kit, there isn’t anything else except the Betta that you could possibly need. This is a great option for beginners who don’t have the know-how yet to hunt down all the parts they need individually. The filter included make the tank super low maintenance and it’s easy to clean. The filter helps the plants take in all the waste so eventually, you won’t need to clean it at all. If you use the basil seeds you’re instructed to wait 3 weeks! The downside of this tank is the waiting period. Many people run out to a pet store for something else and buy a Betta on a whim. So, waiting three weeks could cause serious health issues for a betta waiting in a tiny bowl. Or, for someone planning to get a Betta, this could kill off the excitement of getting a new fish. The upside is that this is an amazing choice for beginners. Because it comes with everything you don’t have to worry about anything else. This fish tank has bent glass that gives a smooth outline and conceals the filtration system, so you can’t see a thing! The kit is an all-around good buy, especially for new aquarium enthusiast. Because it’s small and stylish this is a popular option. Not to mention that it’s easy to move around. Since it’s lightweight you can migrate it from an end table to your office desk. The rail light is an LED system that has both daylight and moonlight settings. Switching from blue and white light is easy. Then the glass cover is great for keeping the tank closed off from outside debris without interfering with the light. The cover easily slides over the filter system that is hidden in the back. Making it easy to feed your Betta or slide it forward to get to the filter. The filter comes out without issue and maintenance is made simple. It does work on a filter pump so there is a current that is fed into the tank. Although Betta’s don’t need the water movement if you have an exceptionally active Betta it could enjoy the extra stimulation. Overall this is a great quality product. It’s a kit with everything you need to get started right away, but if you really want to you can buy a small heater. The one thing that drives most aquarium enthusiasts away from this option is the strong current. 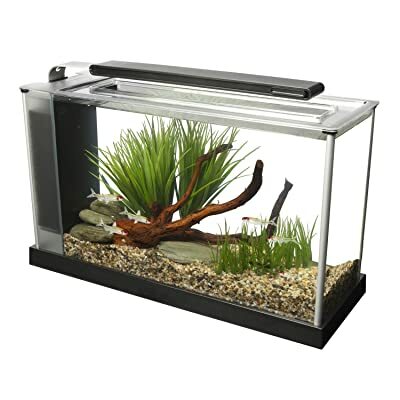 Fluval is a brand well-loved by nearly all aquarium owners, from the enthusiasts to the casual fish owners. 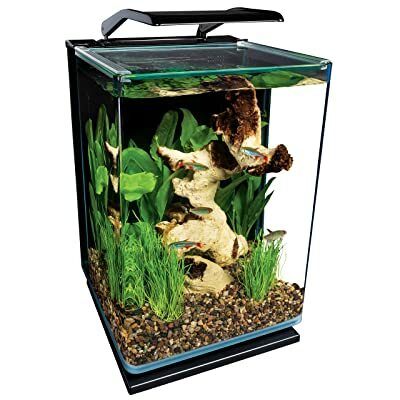 Unlike other Betta tanks, Fluval takes the classic approach to tanks. They chose to avoid the aquaponics filter system framework and instead went with a 3-step filtration system. It’s easy to use a system that isn’t about the bells and whistles. It keeps clean etched glass to achieve a modern look that is small but offers enough space for exceptionally active Bettas. Fluval keeps its kit lightweight so it can easily move from desktop to countertop. The tank is also classically rectangular. The no-frills effect reels in a lot of beginners who are looking a quality Nano-tank. The lighting framework is an overhanging system that uses 31 LED lights to give full coverage light to the tank. Also, as part of the kit Is the circulation pump which has an adjustable output spout. The filtering system makes it, so you are only cleaning the tank on a rare occasion. The downside is that some people report that the LED system is a bit spotty and the filter system can cause slightly more stir than desired. Keep in mind that for less active Betta, high lighting and a water current is best avoided. The Fluval system offers a lot for a variety of Betta personalities. Not to mention it hits on many of your needs as well. It’s flexible in where it can be placed and it’s easy to maintain. 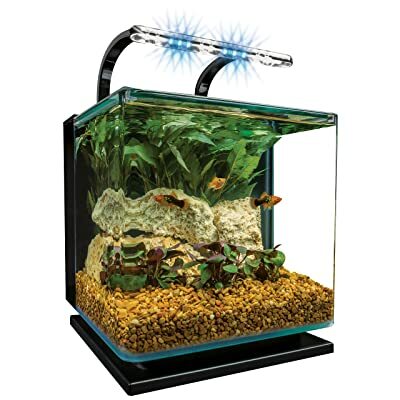 This picture aquarium is built to keep your fish happy and healthy. A picture aquarium means that it is taller than it is wide giving a portrait quality to it. The bent glass gives a wonderful view of the entire tank, making it perfect for growing plants as well. Marineland is a well-known name in aquariums and they know where to deliver. With a simple, sliding glass cover you can easily access the fish for feeding or the hidden filter system for maintenance. This is a great size for an energetic male Betta who needs room to zip around. Marineland brings another great option with this portrait aquarium kit. This roomy option is great for a Betta who has outgrown their current home, or if you are daring and allowed your Betta to have tankmates. However, this isn’t a great option for the Betta who just wants to float in the sun. Beginners love this kit and the experts do too. The kit comes with everything needed. The filter system is quiet and easy to maintain with its quick-change filters and clip-on filter. Then the kit rounds out with an LED system that is high-quality for daytime use with white lights. While you can get this kit in either a 5, 10 or 20-gallon option, the 5-gallon is more than enough space for a single Betta. 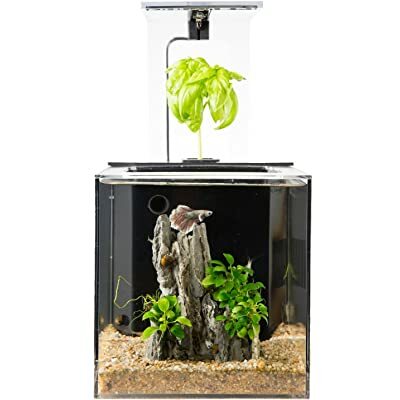 This Nano tank can set your colorful, playful Betta up for a wonderful time darting back and forth in its wide-open spaces. The tank is easy to move but can be difficult in managing the electrical that goes with it. Marina is an Amazon choice for a reason. It has built up a reputation for great starter kits and doesn’t disappoint with this one. Keep in mind that because this is a five-gallon tank a less energetic Betta may not use all the space. This is an option to keep in mind if your Betta is getting bored of swimming in circles. The winner in this situation is the Fluval Spec V Aquarium Kit, because of its simple design. It comes with everything you could need to get started, excluding the Betta. Not to mention that the LEDs work well nearly all the time and the filter system doesn’t cause so strong a current that a lazy Betta would be irritated. Some customer reviews point out that the LED system is a bit spotty. But that’s a benefit of an LED system is that you still have light even if one or two LEDs burns out. If you’re looking for something to get you started right away, Fluval is a great choice that delivers for both high and low energy Bettas. Then it is compact and quiet enough to take from room to room as you want to move it around. If you’re looking for the best betta fish tank you should consider any of the options on this list! Does the Ecocube grow plants, in the photo, it looks like its kinda like an aquaponic tank. Also is 2 gallons big enough for a Betta? Yep, the fish creates waste. The filter turn the waste into fertilizer for the plant and the plant grows and cleans the water. I think 2 gallons big enough for a Betta. Thanks, Dawn. Though I do like the Ecocube look I think one of the larger ones might be better. I like the Marineland kit looks great in the photo.